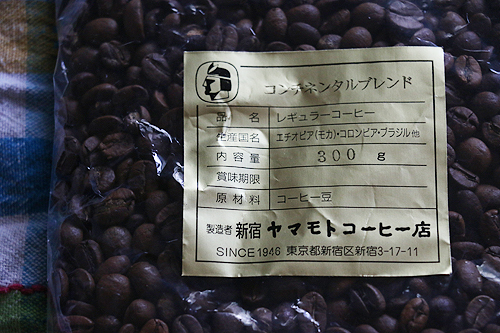 My friend Eva brought these beans for me as a gift from Japan. 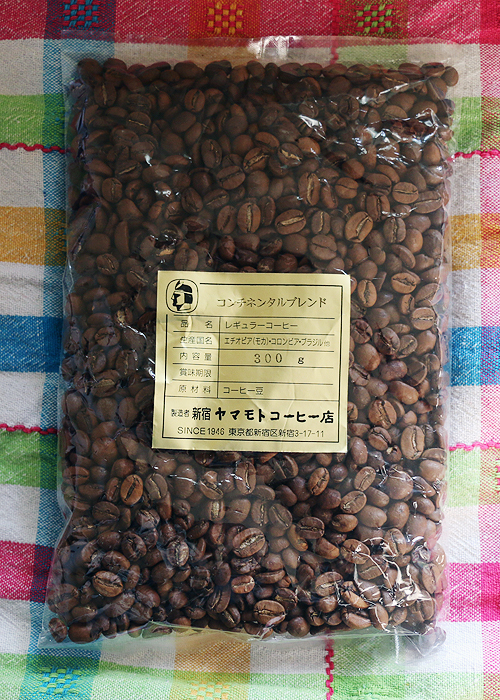 She asked me if there was anything I would like from Tokyo and I asked for coffee beans roasted in Japan that would be suitable for filter brewing. 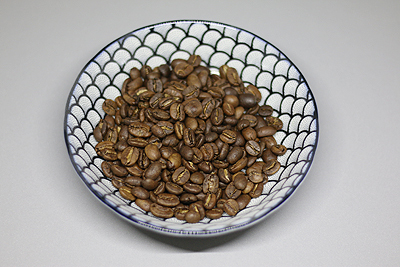 The beans are from a coffee and tea specialized store in Shinjuku called Yamamoto Coffee. Not much information on the package other than bean origin and the manufacturer information. Not a big fan of the clear non-resealable package the beans came in, but eh. I transferred the beans to a jar after I opened them, so they wouldn’t spill from the plastic bag or lose their aroma. When I opened the bag, I was greeted by a strong, almost sweet smell- kind of like chocolate toffee, very pleasant. The beans are all different shapes and sizes (thinking it’s because it’s different beans from 3 different places, yes? ), but the beans are whole and there is no dust or other refuse among the beans. The roast is on the lighter side. The brewed coffee had a very weak unremarkable smell. I expected a more distinct smell considering how aromatic the unground beans were. The taste however was rich and the mouthfeel slightly creamy. I tasted strong plum flavour. No aftertaste of note. A simple straightforward coffee flavour, not very complex. Is it still drinkable when the coffee gets cold? – Yep. The sweet plum turns slightly bitter cinnamon and nutmeg-y, but it’s still nice enough to drink. Would I buy/drink this coffee again? – Sure, it was alright coffee. Wouldn’t go seeking it out specifically, but when offered, would not turn it away. The package design is simple and to the point. It probably wouldn’t pull my attention among other coffee packages, but it’s clean and has a classy sophisticated feel. Plus points to the fact that the bag ziplock closes easily again after opening, so I don’t have to worry about the coffee getting stale quickly. 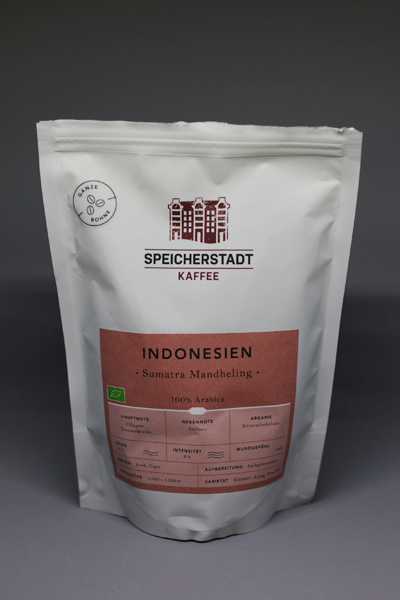 Beans: 100% Arabica beans from Gayo highlands in Aceh. Grown around 1050-1350m above sea level. Flavour notes: plums, dried fruit as main notes; liquorice as undernotes; bitter chocolate as aftertaste. Promises a rich mouthfeel. Suitable brewing methods: aeropress, filter, French press. When I opened the bag, I was greeted with a strong, a bit acrid smell. No special aromatic notes I could distinguish from the general “smells like strong flavoured coffee” smell. 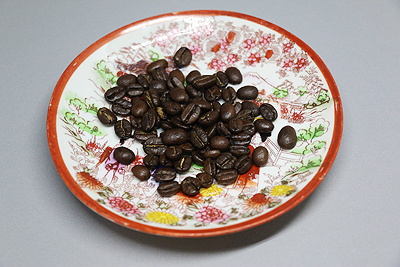 In general, a good solid coffee bean aroma 😀 The beans were whole and not broken, which I have been told is a good thing to notice about coffee beans. 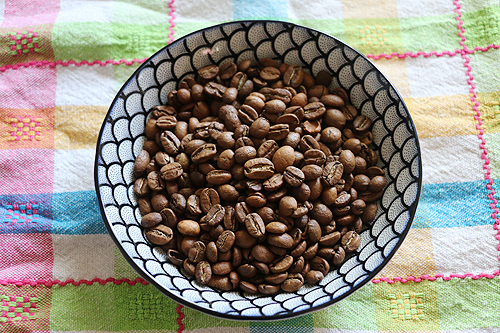 The bean sizes vary a bit here and there and the roast colour has slightly different tones in it. Brewing method – drip coffee machine. Does this count as filter coffee? It should, right, as the drip machine uses a paper filter too. I was too lazy to play with my chemex as I don’t have a proper pour-over kettle yet and my ceramic water kettle is too heavy to bother. The coffee produced from the bean had a deep smell, but nothing very memorable. Smelled like a good cup of simple coffee 😀 The mouthfeel is indeed full and slightly juicy. At the first sip I can definitely taste a subtle dried plum flavour and a very strong bitter chocolate aftertaste. There is also a bit of something that reminds me of tobacco in the lingering taste… or the taste of the way cigarette ash smells like, if it makes sense. It’s not an unpleasant flavour. I am not certain about liquorice though. Could it be the ashy undertones I got? To me this flavour is not sharp/tart enough to resemble liquorice. Is it still drinkable when the coffee gets cold? – Yes. The sweetness of plum disappears a bit and the tobacco intensifies, but not so that the flavour would be unpleasant. It’s a totally okay coffee to drink while it has gone cold. Would I buy/drink this coffee again? – I would drink this again if offered or given as a gift. Not certain I would desperately go seeking for the beans myself however. 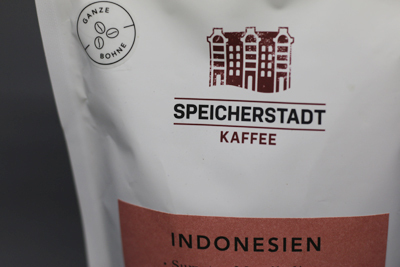 It was good enough coffee that I would gladly enjoy another cup of it, but unremarkable enough for not to be bothered to try and acquire the beans again, considering one can get them only from Germany. Blend origins – Marcala, Honduras. Chiapas, Mexico. Yirgacheffe, Ethiopia. Flavour notes – cocoa, caramel and peanut. Recommended brewing method – French press. Firstly, the package: I love the package design quite a bit and how functional the bag is. It’s easily tightly resealable, keeping the coffee fresh much longer than some other coffee packages I’ve come across. Very A+! When I picture a great cup of coffee I think of sitting with my friends in an old diner after a great night. 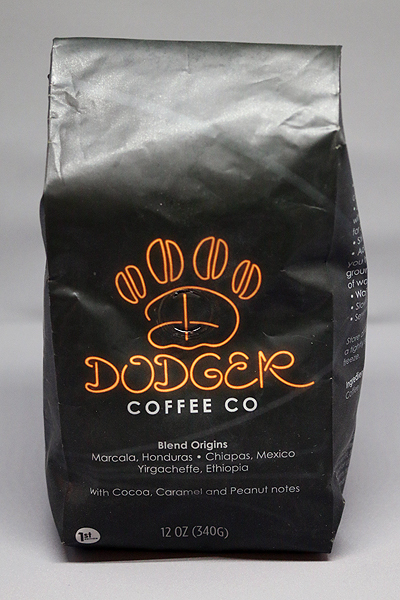 That’s why we made Dodger Coffee Co, to have the perfect coffee for friends to share. 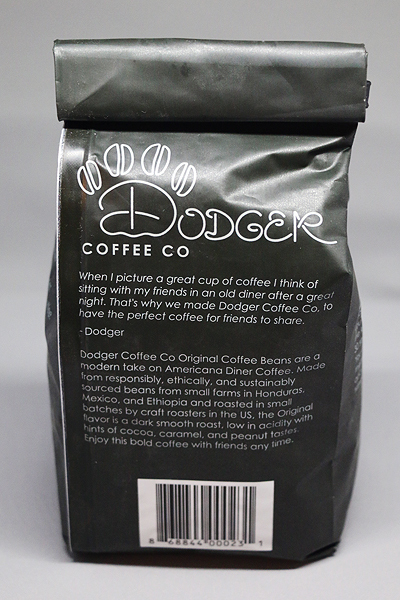 Introduction on the package: Dodger Coffee Co Original Coffee Beans are a modern take on American Diner Coffee. 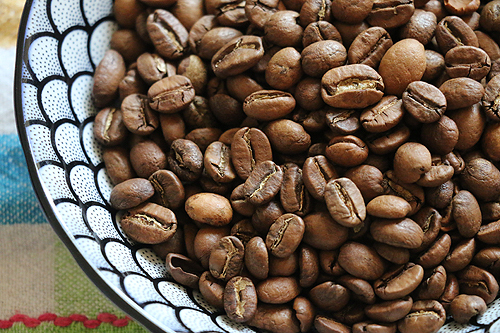 Made from responsibly, ethically, and sustainably sourced beans from small farms in Honduras, Mexico, and Ethiopia and roasted in small batches by craft roasters in the US, the Original flavour is a dark smooth roast, low in acidity with hints of cocoa, caramel, and peanut tastes. 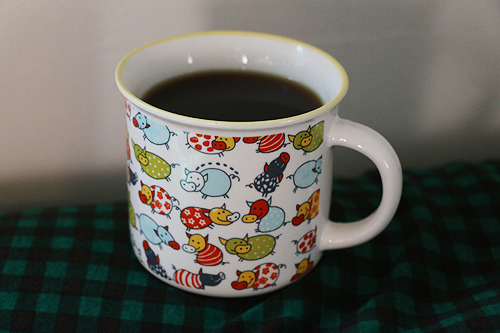 Enjoy this bold coffee with friends anytime. 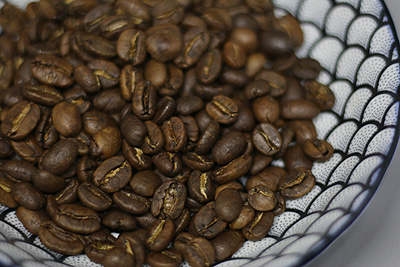 Brewing method – drip coffee machine. Yes, I know the recommended brewing method was French press, but after rediscovering drip coffee, I am finding a hard time going back to the French press. Perhaps in the future I will endeavour to attempt the recommended brewing methods on the packages, but for now, I love my drip coffee machine ;-; It gives me good coffee, don’t judge! I have never been to America, so I have never been to an authentic American diner to know what their coffee is like, but I do have an active imagination. When I close my eyes, take a sip of this coffee, I can almost hear Dale Cooper exclaiming: “You know, this is – excuse me – a damn fine cup of coffee!” When I think of diners, I automatically think of Twin Peaks, it’s just how it is. 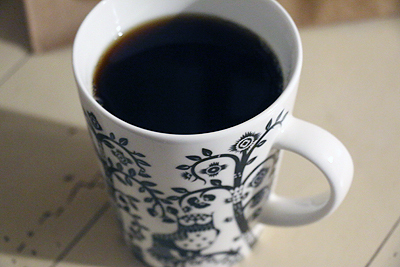 I am not a fast drinker, so when I make myself a big mug of coffee, about half of it usually goes cold. 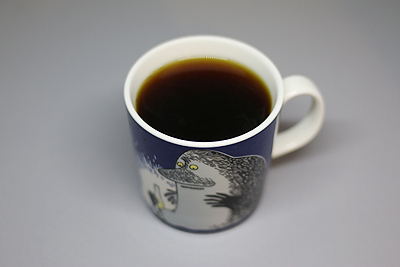 Some coffees do not taste nice when they have gone cold, but this one is still very enjoyable even when cooled down. I also gave it a go on ye olde V60 dripper at work, which gave out a slightly stronger flavour than the drip machine. I would say both brewing methods worked well for these beans and I quite enjoyed both experiences. Would I buy/drink this coffee again? Definitely! I am already planning to order a new bag soon. Find Dodger on twitch, youtube, twitter. – More coffees I have tasted.